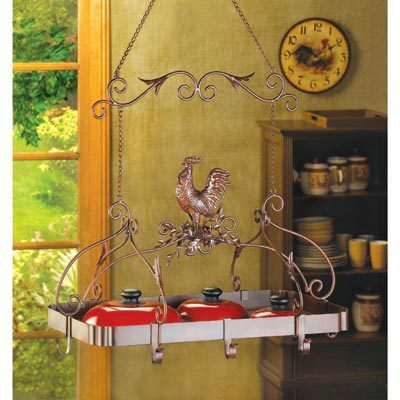 COUNTRY ROOSTER KITCHEN RACK home decor, jewelry, decor, decorations, electronics, fountains, floor mats, art glass, vases, garden essentials, fireplace screens. Attractive overhead rack puts your pots and pans right within easy reach; a must-have for any serious chef! Jaunty rooster and scrollwork theme and rich rust-red finish add informal elegance to your kitchen. Material(s): IRON. Weight 7.8 lbs. Iron. 23" x 15 3/4" x 34" high.